Having recently made the transition from Sole Trader to Limited Company, I was looking for some way to document all business transactions smoothly and hassle-free over a few different currencies. 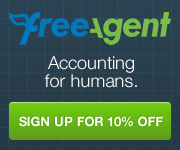 This is my FreeAgent review. Remembering the Freeagent demo I tried a few years previously, but opted out of because of a lack of multi-currency support, I went back to check. It turns out that they have added multi-currency support and a host of other features alongside. Having set up both Sole Trader and Limited Company accounts at FreeAgent, each with their own prices and features, I was able to get a comprehensive overview of how they both work. The main differences are in the legal obligations inherent in each business entity; Limited Accounts also calculate Corporation Tax, for example. The menu system is very easy to navigate and the dashboard home screen lays out all your key information at a glance. You can find out who owes you, when and how much; how much cash your business has over its various bank and online merchant accounts; when your next tax payment is required; recent expenses and even your current profit situation. All of this data is calculated automatically from uploaded bank statements, saving hours of admin every month. All that is left to do is label each payment, expense and sale. You can then get great overviews of your financial position and obligations. It is also easy to create a user account for your accountant to log in and download all the information they require once you are done reconciling the double entry book-keeping by checking that your balance matches the balance on your bank statements on the final date of the tax year. For ease of use it receives top marks, as it beats any alternative I’ve ever used hands down, be it spreadsheet or paper. Costs vary from Sole Trader at £15 (+VAT) per month to Partnership or LLP at £20 (+VAT) to Limited Company at £25 (+VAT) per month. There are no set up fees and there is a a 30 day free trial, so it is really easy to test, with no contracts to sign. A very manageable expense, then, for a product that is designed to ultimately save you more money than it costs. You can use the information created in FreeAgent to save money with accountants, saving them from combing your receipts and charging you by the hour for the privilege. You also save time. Lots of time. From the tedium of entering purchases or sales figures into spreadsheets or other software ledgers, you can spend those hours now focusing on growing the business, rather than drowning in it. I have read in places that some people save an average of 4 hours a month. I’d say, with the integrated invoicing and banking features, that I save at least that; but I expect I save somewhat more given the automated invoice overdue reminders and automated corporation and self-assessment calculations. If, like myself, you need to get the books in order in a very efficient way, I can’t recommend FreeAgent enough. It is worth every penny to remain organised in such a tidy and cost effective way. Finally, as a FreeAgent ‘evangelist’, I can offer you 10% off (forever) the cost of the monthly subscriptions charged by FreeAgent. I will also receive 10% off, which was part of my reason for writing this blog post in the first place, but I can assure you I wouldn’t recommend it if I didn’t like it. You will also be able to refer people, earning further 10% discounts until the cost is zero. Published by Luke 20 Jul, 2011 using 624 words.